In the final speech of his India visit, US President Barack Obama told the audience at Delhi’s Siri Fort Auditorium that India would progress as long as it is not “splintered” on religious lines. The 53-year-old leader even went on to cite Article 25 of the Indian Constitution to remind Indians of the “right to freely profess, practise and propagate religion.” Obama’s exhortation on religion was his strongest message to the Modi government. Ever since his arrival in India on January 25, Obama and Modi concentrated on increasing the trade relationship between the USA and India. During the course of the visit, the Indian government focused on showcasing the nation’s rising military might and economic progress. The domestic media was all praise for Modi’s new friendship with “Barack” who acknowledged the Indian PM’s popularity by comparing his reception at Madison Square Garden to that of a “Bollywood star”. But the proof of the pudding is in the eating. Throughout his visit, Obama stood shoulder to shoulder with Modi as shutterbugs immortalised handshakes and hugs. The only opportunity Obama had to address the Indian populace alone, without the presence of Modi, was at Siri Fort Auditorium. And he used the opportunity to raise the concerns of the US about India. Obama’s emphasis on preserving diversity indicated perhaps that Washington wasn’t as concerned about the increasing financial clout of India as it was about the increasingly apparent religious bigotry. So why did the most powerful person on the planet choose to caution a country which is known for encouraging pluralism and secularism? The answer lies in the fact that ever since the Modi government has taken to office, fringe groups belonging to the Hindu Right have increased their vitriol towards minorities, mainly Muslims. In Uttar Pradesh, BJP MP Yogi Adityanath raised the false bogey of “love jihad”, claiming that Muslim men were eloping with Hindu women to convert them and increase the Muslim population. Uddhav Thackeray, quoted in the Shiv Sena mouthpiece Saamna, backed Yogi Adityanath, stating, “Love jihad is an international conspiracy to destroy the Hindu culture.” In another speech, Adityanath also claimed that the rise in the population of a certain community was the reason behind the UP state government failing to maintain communal harmony. The notion of “love jihad” didn’t inspire the electorate, however, as the BJP recorded a poor show in the UP by-elections. Interestingly, the same state had provided the party with over 70 legislators in the earlier held general elections. But the Sangh Parivar learnt no lessons and carried on with their agenda. In October, Vishwa Hindu Parishad patriarch Ashok Singhal told reporters that since the BJP government had majority, it must fulfil its promise of building a Ram temple in Ayodhya. In Ghaziabad the next month, Praveen Togadia said that the Ram temple would be built at “any cost”. By the time December came, incendiary comments were flying thick and fast. Union minister Sadhvi Niranjan Jyoti made the reckless “ramzaadon” remark at a public meeting in Delhi. Instead of being shown the door, she walked free with an apology. Sakshi Maharaj, a BJP MP, referred to Mahatma Gandhi’s assassin Nathuram Godse as a “patriot”, while BJP UP chief Laxmikant Bajpai claimed that the Taj Mahal was an ancient temple. Such proclamations were not limited to the lesser known leaders. RSS Sarsanghchalak Mohan Bhagwat repeatedly stated that India was a Hindu Rashtra, while External Affairs Minister Sushma Swaraj demanded that the Bhagavad Gita be declared as the country’s “national scripture.” But the biggest controversy of all was the alleged forceful conversion of 300 Muslims to Hinduism in Agra, resulting in pandemonium inside Parliament. As the Hindu Right grabbed headlines, their Muslim counterparts were not far behind. The politics of competitive communalism was underway. Samajwadi Party leader Azam Khan demanded that the control of the Taj Mahal be handed over to the state Waqf Board; earlier in April 2014, he had said that the Kargil war was won by Muslim soldiers. MIM leader Asaduddin Owaisi tried a reverse definition of “ghar wapsi”, proselytising that the real homecoming would be when people returned to the Islamic faith. 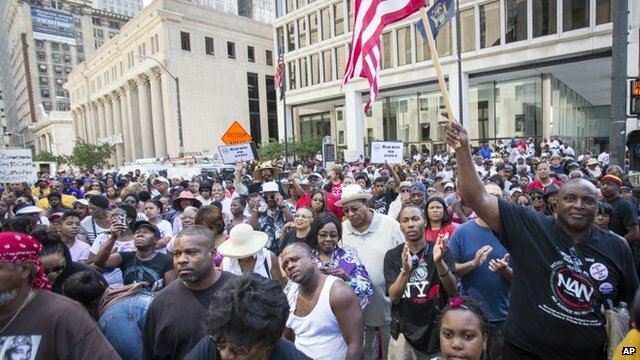 Unfortunately, the communal atmosphere wasn’t limited to merely hate speeches. In June 2014, a Muslim techie was beaten to death by a group of Hindu fundamentalists. 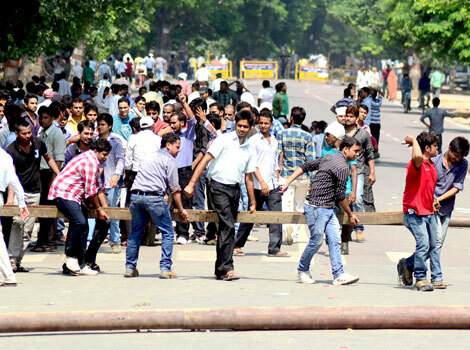 Communal tensions spread in several cities including Delhi, Meerut and Vadodara. Films and books fell victim too. While protests greeted against Aamir Khan starrer PK, Tamil author Perumal Murugan decided to stop writing after his book Madhorubhagan became mired in controversy. All this was conveniently happening at a time when Dinanath Batra was orchestrating the rewriting of Indian history books and ridiculous myths were being propounded. PM Modi joined the bandwagon by claiming, among other things, that people in ancient India knew plastic surgery (as evident from the elephant head of Lord Ganesha!). It was under these circumstances that Obama reminded the government of the need to safeguard the freedom of religion. Not that it made much of a difference. Shortly after Obama left, there was another controversy around an advertisement published by the government on the occasion of Republic Day which had printed the original preamble to the Constitution, which did not have the words “secular” and “socialist”. The Shiv Sena was quick to call for the deletion of the word “secular” from the Preamble, even as the government defended the advertisement. Political leaders in India need to realise that it is economic progress is hollow if religious amity is not preserved. But for that to happen, all political parties would have to rise above politics and stop playing the religion card. Glamourizing terror? Rambo and Obama do it better! 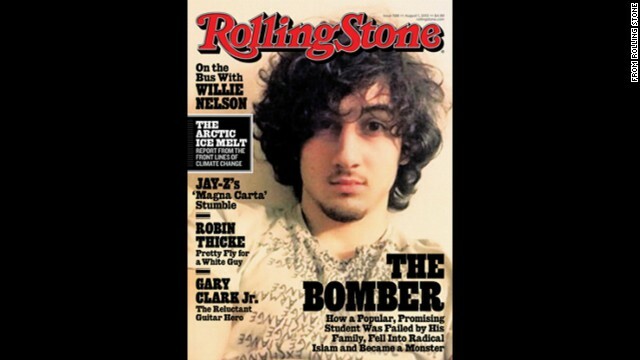 A popular magazine in the United States by the name of Rolling Stone has courted controversy by placing a glamorous image of Dzokhar Tsarnaev on the cover page of its latest issue which will hit the stores on August 3rd. Dzokhar Tsarnaev happens to be an accused in the Boston Marathon Bombings which took place on April 15th this year and led to the death of 3 people besides injuring 264. Dzokhar carried out the entire attack in complicity with his elder brother Tamerlan Tsarnaev. While Tamerlan Tsarnaev died in the shootout which occurred between the brothers and Boston police, Dzokhar was arrested in an injured state and has been charged with several offences pertaining to terrorism. The attack carried out by the brothers was in retaliation to what the brothers considered to be an unjust and hostile foreign policy of the United States towards Muslim majority countries. The American entertainment industry however cannot be totally absolved from the allegation of lionzing terror as was done in Sylvester Stallone starrer Rambo. The representation of Afghan Mujahideen as patriotic freedom fighters fighting against Soviet repression was done effectively and repeatedly by Hollywood as part of CIA-sponsored propaganda against communism. The world today is aware of the havoc which was caused by these mujahideen once they came to power in Afghanistan. If American human rights activists are genuinely opposing glamourization of terror then they should not only condemn several award-winning movies made in the 1980s but they should also stand in opposition to US President Barack Obama’s decision to lace Syrian rebels (associates of Al Qaeda) with weapons to fight the illegitimate regime of Bashar al-Assad in Syria. We need to categorically realize two things in regards to the Syrian conflict: First, the United Nations and not the United States has to take the lead in toppling the Assad regime which is guilty of fuelling a conflict which has left 93,000 people dead and second, the United States cannot aid an Al-Qaeda affiliate group when Al Qaeda itself is responsible for murdering thousands of innocents citizens across the world. Till Washington doesn’t take such a step, there is no point in misinterpreting and blowing out of proportion a story whose purpose is nothing but to bring to its readers the transformation of a boy into a terrorist. The astonishing victory of Governor Mitt Romney in yesterday’s first Presidential Debate is indicative of a possible change of guard in the White House which could see Barack Obama become yet another victim of the global voter disillusionment fuelled because of the economic slowdown and which has already stumped leaders like Nicolas Sarkozy and Silivio Berlusconi in the past one year. The bleeding economy was the main issue of discussion during the first of the three Presidential Debates and was dominated by concerns relating to jobs, tax cuts and deficits. None of the two candidates could deliver a devastating blow to their competitor’s Presidential ambitions but what worked for Romney was his controlled aggression when compared to Obama’s lack of responsiveness as he repeatedly failed to dodge the accusations leveled against him by his Republican compatriot. One of the biggest strengths of Obama when he ran for Oval office four years ago was his amazing personal story which he exploited in the best possible manner to woo voters. Last night too Obama began on the same personal note by wishing his wife a happy anniversary from the stage but the magic didn’t work this time around as tales and anecdotes of personal struggle and valour got buried under the heavy mountain of financial problems faced by America. It was disappointing to see Governor Romney lead the opinion polls after the debate since he indulged in moral impropriety last night by capitalizing on a number of untrue statements. Global politics has since 2007 witnessed a wave of populist political rhetoric and anti-government sloganeering but the reason why it needs to be despised is because those who are indulging in such mudslinging have themselves had a very dismal personal record. They offer no real solutions and do nothing except from basing their campaigns on opprobrium of the incumbent government.